Despite the dedicated efforts of many individuals and organizations, the great apes—our closest living relatives—are on the very edge of extinction. This sweeping atlas provides a comprehensive overview of what is currently known about all six species of great apes—chimpanzee, bonobo, Sumatran orangutan, Bornean orangutan, eastern gorilla, and western lowland gorilla. 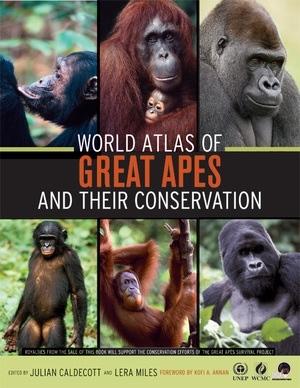 Created in association with The Great Apes Survival Project (GRASP), this book gives a thorough background on ape behavior and ecology for each species, including detailed habitat requirements, the apes' ecological role, and the possible consequences of their decline. World Atlas of Great Apes also offers a full description of the threats, current conservation efforts, and additional protection needed for each species across its entire range. Many full-color maps and illustrations make the abundance of information accessible to a broad readership, from specialists and policymakers to general readers concerned about the survival of these charismatic primates. This book represents the work of a dynamic alliance of many of the world's leading great ape research and conservation organizations. Bringing together United Nations agencies, governments, foundations, and private-sector interests, the project aims to raise the international profile of great ape conservation and to build the political will for further action. Readers learn about work being done by specific organizations in support of great ape conservation, and where conservation is most needed and most likely to be effective. Julian Caldecott is an ecologist and primatologist by training, doing his doctoral research on macaques in Malaysian rain forests. He has worked on wildlife management and biodiversity conservation throughout the global tropics, including projects to conserve Bornean and Sumatran orangutans, western and Nigerian chimpanzees, and Cross River gorillas. Lera Miles is a biologist with the UNEP World Conservation Monitoring Centre who analyzes threats to biodiversity ranging from global to local scales. Her specialities include species mapping and modeling, vulnerability assessment, and priority-setting.